Find below just a few of the testimonials of I have received from some of my customers who have purchased or used my products. Jim, I don't know if I ever mentioned how much I enjoy your articles and readings. You have a great understanding of the game, but even more you can articulate it on a clear concise way. I've learned a lot from you without ever being on court with you and have been able to utilize and supplement a lot of what I teach or even explain what I teach better. I love the thud, gravity step, service stuff, and the initial turn. I think where I have done a great job is taking a lot of this information and being able to convince the masses of its validity, importance, and how it directly impacts that persons performance. Jim, I agree with all other testimonials of your instructions: you do an excellent job of explaining core aspects of the game, in a very easygoing yet to-the point way. You obviously have thought about the game a lot through your career, and can condense those reflections. Your course has really helped me in understanding the fundamental mechanics of a kick serve, and I'm on my way to having a quite effective one in a short time. I think that your instruction system is by far the best out there, with the very short video clip format and relevant information. In other net-courses that I have seen, they often talk too much, with conviction talking more but with less substance. The kick serve is not well covered at all in other sites. I like the fact that I have a few simple, basic points to fall back on when things start to get tight in matches. In particular, can I still "tell the time". ...also, from your other material, I have been working on turning my body and footwork BEFORE I make a swing. What a difference, I feel much more relaxed, am swinging with much better tempo rather than flashing at the ball and generally hitting better groundstrokes. Jim, I had a very weak serve despite having taken lessons for more than twenty years, and having read many tennis books. They had told me stay loose, keep my elbow high, bend my knees etc, but nothing seemed to help. So when I saw an announcement about MTKS in Brent Abel's website, I jumped on it. I must say that watching videos has been much more effective for me than taking lessons. While studying your material I had several "Aha!" moments. It has taken perseverance and hard work, and my serve is still a work in progress, but now I routinely hit kick serves to both sides of the court. Now I win points just by kicking it to the ad court. I am still amazed when I see the ball curve down, hit the sideline and kick to my opponent's backhand. My serve is not a liability anymore, and I enjoy each time that I hit a kicker. Thank you, it has been a great learning experience. Jim -- at the start of this new year, I'd like to thank-you for all of the great online instruction you have provided. MTKS and Building the Serve from the Ground Up have both been instrumental in turning my former weakness into a "partial" weapon. I say 'partial' because I am still working on this most important stroke. It takes time and patience. Your online instruction is clear and precise. I continue to gradually improve and my hitting partners all notice a big difference in the quality of my serve over the past several months. I also thank you for the timely and constructive feedback after I upload my serve videos. The serve is so, so important and I look forward to further 'tinkering' my service motion under your thoughtful guidance. Thank-you for opening my eyes and guiding me on this fun journey of self-discovery! Incidentally, your MTKS lessons have increased my first serve percentages to levels that didn’t seem possible. I use this serve nearly exclusively for both the first and second serve. You have helped me turn my weakest part of my game into a weapon. Your other video regarding hitting up on the ball with a throwing motion has really put some pace on my serve and has made it much more unpredictable for my opponents. I purchased another service video from a competitor, but your videos have been THE most helpful from the very outset. I don’t regret a dime I spent for your video instruction. I’m 66 years old and have never enjoyed the game more. I’m consistent, confident, and composed when serving now and that confidence has upped my game in other areas as well, thanks to you. Jim, I would say the “Mastering the Kick Serve” is one of the best serve instructions, if not the best, I have ever seen. It is better than the Building the Serve from the Ground Up, I think that is the name, anyway that is the first serve instructional product that you made. But probably what I learned from your first serve program that helps me to appreciate this Kick Serve program more. Seeing the ball spin up or sideway with pace after the bounce without much effort is muck like poetry in motion. I have not reached the point where I can consistently do that one after another, but I know I am well on my way. I want to suggest to my fellow tennis warriors, practise at the service line first (as suggested by Jim) so that you can get a nice spin and pace with an easy motion, and then move back a little by little to the baseline, in that way you can really feel what is like to hit a effortless fluid serve. Sometimes I just say to myself, wow, I can do that ? This is cool! Thanks. 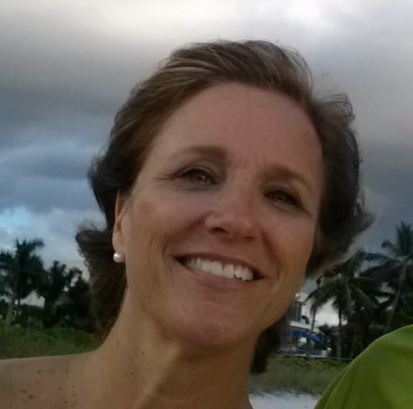 I am a teaching pro with the Ritz-CarltonResort in Naples, Florida. I have been teaching for over 20 years and believe I have found the best video concerning teaching the serving. I can not tell how much I enjoyed your video and what I have learned from it. I am also a high school coach and all my students will watch this video. Again thank you so much for the knowledge. I will take this information and pass it on to all my students. I have all your teachings. Most of all though Building the Serve from the Ground Up has absolutely changed my tennis life completely. From being laughed at – at best – to being feared for my service spinned, kicked, flattened! Yes, what a change of self confidence when the serve functions. From there everything else can only improve. But following your teaching methods is of course important. Small steps forward. Patience. Practice with a goal. Jim, your instruction [style] is one of the most amazing teaching and learning processes I have ever had. I've played competitively for decades, in college and now in USTA age groups, and I'm really enjoying the work with you to correct a lifetime of issues with my service motion and results. The way you use visuals, written, experiential (with the on-court work), and audio speaks to all my sensory inputs. I'm taking your Serving instruction (BTS), which are my first lessons with you, and your approach is so thorough and different than any other source of instruction. Happily rebuilding my serve in Colorado, with your wonderful insights! At the time I first tried Building the Serve, I was a man with decent second serves. After two days intensive work on this course, I had discovered a first serve. At the time is was a revelation; so much power with so little effort. Today, two years later, I’ve been using exercises from this course to refine parts of my serve and remind my body how to let it happen. This is the basis from which all my serve understanding is built. Truly excellent. Jim, The material is absolutely great I hesitate to write in because deep down I don’t want other players finding out how good it is (LOL ) each time I go out to practice I remember the tips or videos , the hot seat is fantastic, I’m still trying to figure out how to take and send in a video. MY GAME HAS DEFINITELY IMPROVED I now have confidence in my serve, I don’t worry about double faults, because I’m to busy trying to see which way the ball is spinning (lol). Jim, You’re BTS (Building The Serve) system is nothing short of exceptional. Really. A very simple, sequential, stepwise learning system that will improve damn near ANYONE, beginners to advanced players. Accompanying the text with short video explanations and demonstrations improves learning tremendously. I’m looking forward to taking this journey and developing my serve, especially for USTA league play, and plan on extending this knowledge to one of my promising high school players. I’m probably going to have him sign up to your site just like I have. Thanks so much!!! I have read several books and watched many videos trying to build a kick second serve. This video has, by far, been the most helpful of them all. Of particular help was the slow motion completion of the swing and looking at your watch. Those types of visualization checkpoints are ideal. At age 56, improving my racquet head speed is the final task to making this my favorite shot. 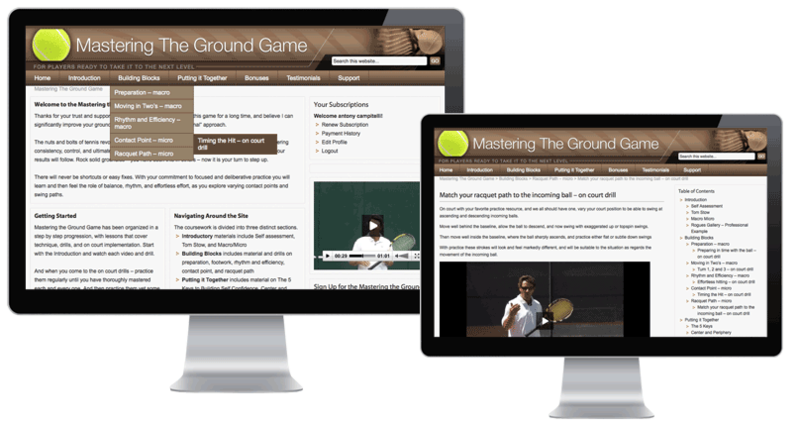 You’ve proven that it is possible to use internet learning to teach tennis in such a careful, attention-to-detail, three-dimensional way that improvement is possible with the proper amount of ‘study’ and practice. Your approach has broken new ground and set a standard that will not be easy to copy…You’ve given this senior tennis player new skills and a welcome new involvement in the game. I tried the serve in the box exercise and both my cousin and I were amazed at the instant improvement. I got 10 out of 10 serves in instantly without much effort. Jim, your serving program has quickly made a change in the quality and consistency of my serves while helping me avoid stress on my shoulder. I don’t own it yet, but I expect to do soon. I think the Key Sequential Elements and On Court Exercises are especially helpful. I have been impressed with the very good work you have done in all elements of your tennis instruction. Please continue! Jim, your integrity is outstanding. Most would have posted the original ‘Mastering the Backhand’ series and been done with it. And it was excellent. But you were not content with leaving well enough alone. Thanks so much for continuing to deliver excellent instruction that goes above and beyond. Outstanding additions to your previously great MTB product. Thank you! I excitedly looked at most of the new items and found them universally clear, helpful, detailed and memorable. Loved the quick written summaries. More later after I have had time to watch all of MTB a couple of times. Bravo! The Mastering the Backhand series was excellent. It covered mechanics and techniques , as well a nuances of the backhand in terms of slices, cross court, floaters, top spin and shots that knife the ball. The Nuts and Blots section was very informative. The drills are helpful and Slo Mo videos and bonus section videos and info superb. I highly recommend this series. 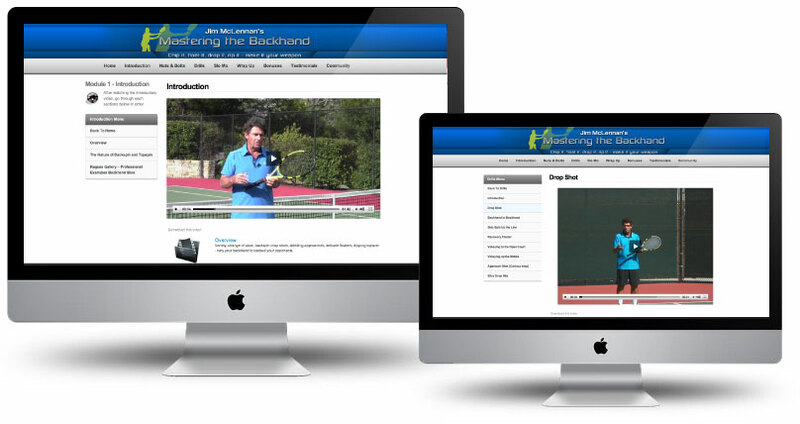 I have been anxiously waiting for this course about the backhand. I love my one-hander, but somehow it takes me so long, years, to brush it up and forge… It still lacks consistency and is used more as a versatile defensive tool… I am determined to perfect it into a weapon now that I have access to your material. I’m one of those players who’s 1 handed backhand had always been more consistent and controlled than his forehand, but it was a slice, lacking real power with heavy under spin. With a few adjustments to grip, swing path and wrist involvement; you’ve helped me develop the “sting & drive” shots turning my 1 hander into a real weapon. Thanks Coach, the results you helped me create have again exceeded my expectations and will keep me coming back for more. Great presentation, it has helped my backhand no end. My backhand is still a work in progress but with your instruction I have made a big improvement, especially with the slice backhand. It is good that I can come back and review your instructions and watch the videos and get back to basics. Also I have to say a big thank you for the instruction that you gave on the second serve. Was able to follow the instructions and have incorporated that serve into my game. Its great to throw in as first serve every now and again. Teaching requires effective and simple communication. The best teachers in any field can synthesize complex subjects so that the student of the subject can understand and apply (“and apply” – most important) what is being taught without being confused by lots of detail and minutiae. 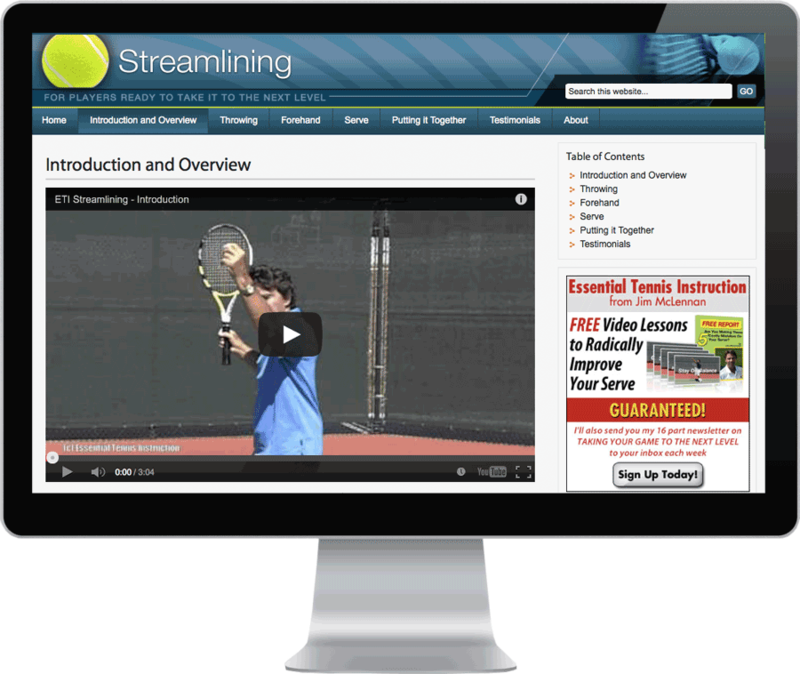 “Tennis Essentials” is the best example of this type of teaching I have seen. I’ve been learning how to play tennis for the past 47 years. This was as helpful as anything I have seen. Also, Mr. McLennan, you have a humility and sincerity that is rare in any field in spite of your vast experience and the fact you clearly know what you are talking about. Jim is a master pro and someone that I will listen and learn from. I have already implemented a lot of concepts I learned from him on my game and with the kids and College players I help. I look forward to his insightful instructions all the time. I have, as you know, all yours classes, but this I would pay again… ha ha ha. Fantastic Jim! What you say actually makes sense and is a no brainer. Thanks for taking out the complexity and making it simple. The left (non dominant) hand initiating the forehand and the elbow leading up on the serve are new and key additions to my game. The Federer and Sharapova comparison of the follow through is incredible because I was taught to jump into the court. Fabulous Jim!! We should clone you and send you all over the world 🙂 Thanks Jim, I owe you big!! When I signed up, the first thing I did was go through the Streamlining material, and that was absolutely a revelation. As I absorbed the concepts and applied them in my practice, all the things I had been learning — the modern rotational techniques, relaxing and effortlessness, corkscrewing down and in and up and out, the axis of rotation on backhands that propels the racket along its path, whipping or slinging the racket, what is happening kinetically during various complexities of the serving motion, etc. — started fitting together into a simple whole. Internalizing what is taught in Streamlining has made such a difference in my game. My new group of partners really notice the changes in my play –each time out — and frankly don’t know what to make of it. It is as if I have a secret. At some point I realized that moving to a new level as a player does not come as a result of merely fixing some part of one’s stroke mechanics, but from fundamentally changing one’s approach as a basis for executing at that higher level of speed and effectiveness. Streamlining provides the basis for that change. The format of the Streamlining was excellent- very easy to follow in sequence. I enjoyed the concept of comparing throwing a ball with the motion of the tennis stroke whether in the forehand or service motion. Well done. I have struggled with my weak serve for decades. This is now the first time ever that I feel confident when I stand up at the serve line. I am winning many more serve games than before. I've been following Jim's work for a few years. His dialogue about tennis and learning about tennis is beyond comparison. His ideas, knowledge, and story telling is unimaginable. You have to follow this master teacher. His gems. of wisdom will lift your game to the next level without doubt. The material is highly educational, thought out and well written, I look forward to his articles, podcasts, everyday. I know I'm a better person and grown as a player, competitor, along the journey. Jim has an incredible ability to distill all groundstrokes (FH, BH, slice, drop shots, etc.) into a few set of common principles. It really helps! Jim, APPLAUSE! After 1 week, MTGG succeed where lessons have failed – helping me immediately understand and start correcting the basic mechanical mistakes and flaws developed over the years. Your ability to demystify (make confusing intricate things very simple) and to provide useable and digestible sound bites and video clips is the best I’ve ever experienced in any endeavor. The “Micro vs Macro” and “Waiting vs Weighting” are just two of the many examples where you provide incredibly effective frameworks within which I am able to self-assess and improve. Like most, I always knew when I hit a good shot vs bad one. Now with MTGG I know the whys and can actually do something about it! Hi Jim, the Mastering The Ground Game is excellent. It is true, that I was expecting something different. But I have to admit, that my forehand now is much better. There are several reasons for that. First I m waiting the ball on the back foot (even if my serve return is now better) a the second mistake was I was pulling my shoulder ahead too early. And the third thing I turn my grip from eastern forehand to the semi western – these grip is very good for the really, but I have got problems with lower or sliced balls – i have to work on it. There are a lot of things on my forehand side which could be better. I found the lesson about moving in two’s especially helpful. I realized that I had been hitting many shots off balance. Just concentrating on not shifting my weight forward too quickly (when I am able to actually do it) has me hitting better, more consistent ground strokes and even helps with power on the serve. While I have not mastered any of the fundamentals in this course, just the thought I should maintain better balance has helped my strokes. Jim’s prioritizing the components of the ground strokes from the core to the periphery is an astounding truth, in my opinion, that was rarely heard of from other coaches in my experience. The 1, 2 rhythm really works, it provides a dynamic balance for my body before the hit. With the 1,2 rhythm I can improvise with my hand more than if I am not using this amazing yet simple concept. Also, Jim, your matching the grip with the appropriate contact point is an eye opener – I never heard of it anywhere else, well, maybe I have been ignorant. Great product.